Learn a good answer for interview question: What did you like least about your present/prior job? A good strategy for answering any job interview question is to try and anticipate what this company might fear about you. Maybe the things you're unhappy about at your present employer exist at this prospective employer. If so, you'll be just as unhappy, even if you make more money. Sometimes this question is also phrased this way: If you could change anything about your current/past company, what would that be? Actually...they are asking you to criticize your current/past employer. You must be unhappy about something, or you wouldn't be sitting here in this interview. What are your beefs? If the same problems exist at the prospective employer, why should they hire you? Before we go over the best strategy to answer this question, I need to clear up some myths about being negative. It's OK to share with your prospective employer problems and issues that are beyond your control and possibly insurmountable. 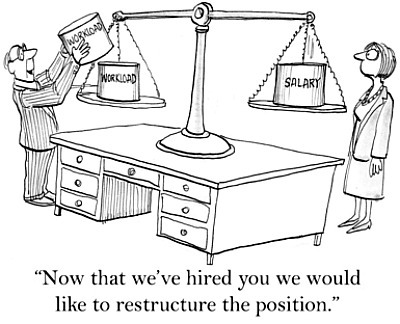 Your company has been doing layoffs and downsizing and their future is uncertain. Your travel requirements have gone from 50% to 75%, and you don't have a life anymore. Your company is losing money, recently filed for bankruptcy protection, or was purchased by a venture capital company. The quality of your company's products are declining, and management is slow to respond to positive improvement measures. You feel you are promotable, but the managers over you are younger and unlikely to leave the company anytime soon. It is not ok to be negative about your boss, co-workers, or say anything of a personal nature about them--even if it is the main reason you want to leave. It's also a bad idea to tell prospective employers that you feel you are underpaid, or unhappy with the benefits at your current company. Companies fear you will just use their offer as leverage to get a raise from your current employer. Companies worry you will be an easy recruiting target the minute someone waves some money at you. Neither of these reasons may apply to you, but being underpaid as your reason for leaving, won't sit well with most prospective employers. OK...now go knock 'em dead in your job interview! Have you taken my Job Interview Skills Quiz?